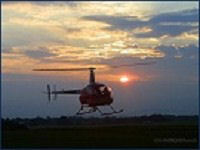 After your pre flight briefing you will be escorted to the helicopter by your instructor. Once you are in and sitting comfortably, the instructor will show you how to hold the controls and explain the interior layout. Your instructor will lift and fly away from the airfield. Once away from the airfield you will be shown the effects of the controls, and given the opportunity to experience flying the helicopter yourself.